Her name is Jane Sullivan and she’s a fictional person. The story is set in present day, part of the novel happening in the US (Arizona and California) and part of it in Paris, France. 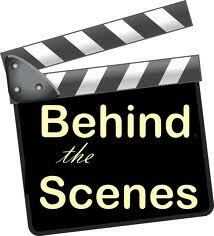 Jane is a widowed make up artist whose goal is to keep her husband’s memory alive and raise their 4yr. old daughter, Ella Rae. She’s very traditional, uptight and lives a simple life. Arrogance and shallowness rub her the wrong way–always. She doesn’t believe in second chances. She gets unwanted attention from Lucas Oliver, an acclaimed model whose face and chiseled abs appeared on thousands of romance novels. 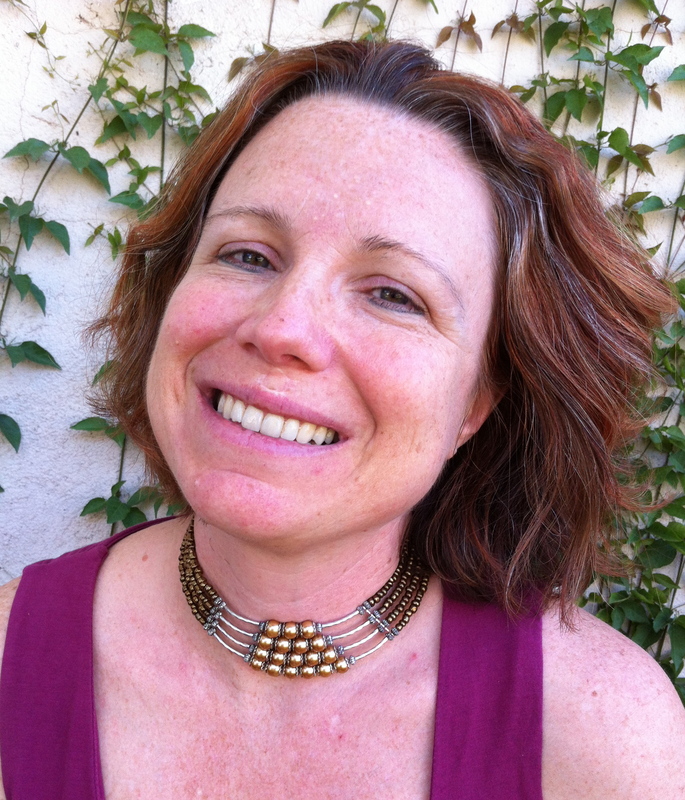 Jane is passionate about writing and pursues her dream of becoming a published author. The working title is Me Tarzan–You Jane. Momentarily I’m shopping around for an agent. More updates soon! We’ll have a press release in the next few months. I hope you had fun learning a few things about my newest finished work. Now hop over at Mimi’s blog to see what she has in store for you (she writes incredible urban fantasy). Ana Calin and Carmen Stefanescu. Both women are fellow Romanians writing in English and their prose is outstanding. Check it out for yourself. If someone said that I’d like another werewolf more than Jacob from Twilight, I would’ve laughed and bet a paycheck that it could never ever happen. Luckily, no one challenged me and I still have my paycheck, but not my heart because another hero came and swept me off my feet. Who is this mystery new guy, you might ask. Let me introduce you to Brandon Ross, a secondary character in the Necromancer’s Seduction by Noemi Ghirghi, writing as Mimi Sebastian. Because of his special place not only in the novel but also in Mimi’s heart, she decided to give him the spotlight as the main hero in The Werewolf’s Devotion. Brandon is a man with a past he struggles to leave behind. En route to finding peace he meets Solange Neves, a doctor in a small Brazilian town. There’s something about Brandon that made me fall in love with him within pages. It has nothing to do with how handsome he is, but with his heart, his emotions he tries to keep in control, his doubts and forbidden attraction. All of the above made him human, a believable, well-rounded character with qualities and flaws one could easily relate to. Another aspect I enjoyed is Mimi’s ability to play with words. Her descriptions are clear, elegant and gracious. Like a painter is comfortable with colors and brushes, Mimi paints the surroundings and the characters effortlessly and very vivid. That’s a true talent and I applaud Mimi for it. The story is short and geared toward the readers of the Necromancer’s Seduction, the first book in the Necromancer Series (urban fantasy). And since this is Mimi’s first release, I applaud her intricate plot development, her unique style and voice. Give her novels a try—you won’t regret it. As a prize for launching Brandon’s story Mimi is offering The Werewolf’s Seduction as a giveaway via various contests, blog spots, etc. If you comment on her blog today, between now and 12:59 p.m. Arizona time, she’ll pick one commenter to receive the booklet. The winner will be announced tomorrow 10/31. Allow me to introduce you to a brand new author and a very dear friend of mine Mimi Sebastian with her debut novel THE NECROMANCER’S SEDUCTION. ImaJinn Books is offering a special deal to celebrate the release of the first book in the Necromancer Series. The ebook of The Necromancer’s Seduction will be available for $.99 for one week only! Find the book on Amazon here and on Barnes & Noble here. She has never feared the walking dead. It’s the power required to reanimate the dead that startles her, seduces her. The power that dwells inside her…and is growing. For Professor Ruby Montagne, being a necromancer has brought her nothing but heartache, and she walked away from that part of her life long ago. However, her quiet existence in San Francisco is shattered when she stumbles upon the body of a slain witch, and the supernatural community insists she transform him into a revenant to track the killer. But his murder was just the beginning, and Ruby soon realizes that the stakes are higher than anyone can imagine—and that revenants have nasty minds of their own. Now demonic creatures have escaped into the human world, and zombies once again walk the streets. For humanity’s sake, Ruby forms an unlikely alliance with a witch, a zombie, and Ewan March, a demon warrior who sets her senses on fire. She’s always distrusted demons and Ewan is no exception, but circumstances push them closer together, and Ruby not only finds it harder to resist him, she isn’t sure she even wants to. But she suspects his job of patrolling the portal separating humans and demons conceals a dark and deadly past that may consume them both. With events spiraling out of control, Ruby unravels a plot that not only threatens the human and demon realms, but puts Ruby’s very soul in jeopardy. Because when the dead walk, no one is safe. Especially Ruby. He was going to kill me. He really was. He motioned for me to follow him. We walked down a short flight of stairs to a spacious basement that looked normal enough, replete with pool and foosball tables, bar, and the slightly damp mildew smell ingrained in the walls of all basements. Nothing that hinted at a gateway to another plane of existence. “Take my hand. You need to be in physical contact with me from now on,” he said. Was this a put on? I eyed his outstretched hand and raised my eyebrows. We walked to a door on the other side of the basement, past the well-stocked bar. He spoke in the demon tongue, and the door swung open. A narrow passageway spilled out before us. “How exactly does the portal work?” I asked. He chuckled. After a few moments of walking down the corridor, my wedge sandals sank into the now dirt floor. I stuck my hand out to my side, feeling damp brick where only moments before I’d encountered plaster walls as we trudged deeper into recesses lit only by oil lanterns. We must have left the confines of the house. Of reality, for that matter. The passageway narrowed until my shoulders scraped against the brick walls, now stained with black slime. The oil from the lamps mingled with another smell, a deep, dank odor that made me feel like I needed to wipe black mold off my body. Out of nowhere a large mosaic door appeared on the wall in front of us. “We’ve arrived at the portal,” Ewan said. He reached a finger out to the mosaic and touched a boat bobbing in the waters of the bay. The tiles shuffled in a flash of color similar to a tile game until they formed a picture of the Empire State Building. The yellow taxi cabs on the street appeared to veer around traffic. The mosaic flexed when we stepped through. Inky blackness greeted me. I stuck my hand out in reflex. Slowly, light poked at my eyes until I saw images swim past my periphery as if I were viewing mirages in a desert. The sound of buzzing cicadas on a hot summer day filled my ears. I couldn’t see Ewan, but his firm grasp on my hand settled my nerves and kept me from losing myself in the sensations. A dark shadow blocked out the images. Then everything around me blurred, and I found myself swaying on a concrete floor. FOR YOUR CHANCE TO WIN A COPY OF THE NECROMANCER’S SEDUCTION, A 15$ AMAZON GIFT CARD OR A SMALL PAINTED CERAMIC SKULL CLICK HERE. Noemi Ghirghi writes as Mimi Sebastian and raised herself on books and the strange and unusual with an unhealthy dose of comics and Saturday morning cartoons. Loving angst-filled romance thrown in the mix, she decided to blend all those elements in a steamy mix in her first Urban Fantasy series, the Necromancer Books. 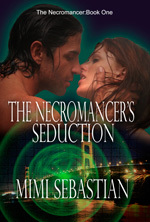 The first book, The Necromancer’s Seduction, debuts July 15, 2013, with ImaJinn Books. Noemi spent two years in the Ivory Coast with the Peace Corps and loves to introduce tid-bits from her experiences in her writing. She’s a member of Romance Writers of America and the Fantasy, Futuristic and Paranormal chapter of RWA. A transplant from the beaches of Florida, Noemi now wanders the desert in Phoenix, AZ, and attempts to balance writing with a day career, fantastic family, and household diva: her Amazon parrot.